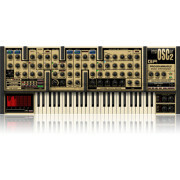 All GForce synths are now available as both 32- and 64-bit plugins. 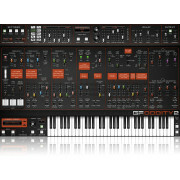 The Virtual String Machine from GForce brings the evocative tones of over a dozen of the finest vintage string synthesizers to your personal studio—Freeman String Symphonizer, Eminent 310, ARP Omni II, ARP Quartet, Crumar Multiman, Polymoog, Elka Rhapsody, Korg PE2000, Logan String Melody, Eminent Solina, Roland RS202, Yamaha SS30 and more. Far more than a preset device, the Virtual String Machine lets you layer any two of the 60 Sample Sets and apply an intuitive synthesis engine to each—as well as add master vintage phaser/ensemble effects. The result is a truly authentic and highly versatile range of textures, perfect for just about every musical genre. 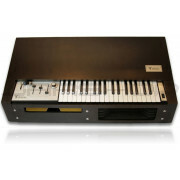 Mac/PC stand-alone or host operation (RTAS, VST, AU). In the 1970s—well before polyphonic synthesis and digital sampling was commonplace—dozens of string machines evolved to emulate sections of violins. They changed the face of music in the hands of Pink Floyd, Stevie Wonder, The Cure, Parliament, Herbie Hancock, Air, Joy Division, Jean Michel Jarre, Thomas Dolby, Genesis, Lonnie Liston Smith and many others. More recently, these vintage instruments have seen resurgence with artists like Kasabian and Goldfrapp. The Virtual String Machine puts those same sounds and much more right in your Mac or PC. Each string machine had its own unique quality. Moreover, some of these gems were rarities only available in certain parts of the world. 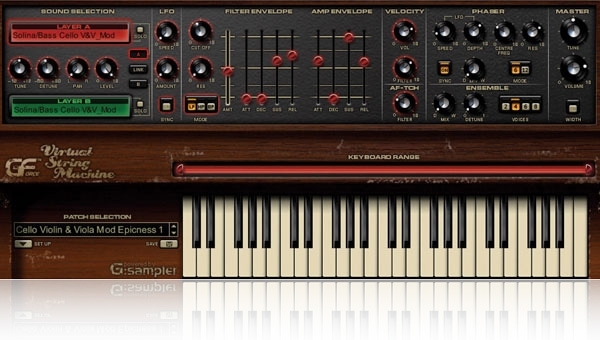 The Virtual String Machine unites the cream of the crop—Freeman String Symphonizer (the first of the genre), Eminent 310, ARP Omni II, ARP Quartet, Crumar Multiman, Polymoog, Elka Rhapsody, Korg PE2000, Logan String Melody, Eminent Solina, Roland RS202, Yamaha SS30 and more. This manifests in over 60 different Sample Sets spanning the many different settings of these venerable instruments—over 3,200 meticulous samples. The Virtual String Machine follows in the footsteps of the other critically acclaimed virtual instruments from GForce—Minimonsta:Melohman, The Oddity, impOSCar and M-Tron. This praise has come from the press, famous artists and the original instrument inventors themselves. Virtual String Machine is no different. You’ll find the same attention to detail and authenticity in every aspect of this incredible creative instrument. You can use the Virtual String Machine by itself or as a plug-in with most popular host applications including Pro Tools M-Powered/LE/HD, Ableton Live, Cubase, Logic, GarageBand, SONAR, Digital Performer, and ACID. 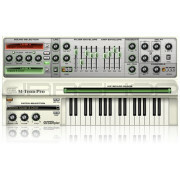 Compatible formats include VST 2.0 (Mac/PC including VSTi), RTAS (Mac/PC) and Audio Units (Mac). In other words, you can integrate it with the rest of your studio and use it just about any way you want.